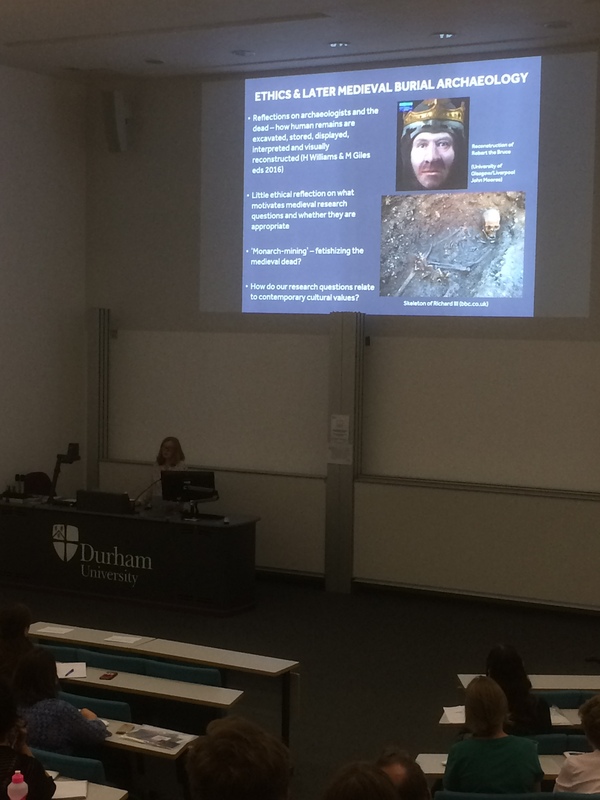 I’ve just returned from the 2018 Society for Medieval Archaeology conference at the University of Durham (13th-15th July 2018): Grave Concerns: Death, Landscape and Locality in Medieval Society organised by Professor Sarah Semple, Dr Kate Mees and Dr Celia Orsini of the Department of Archaeology. 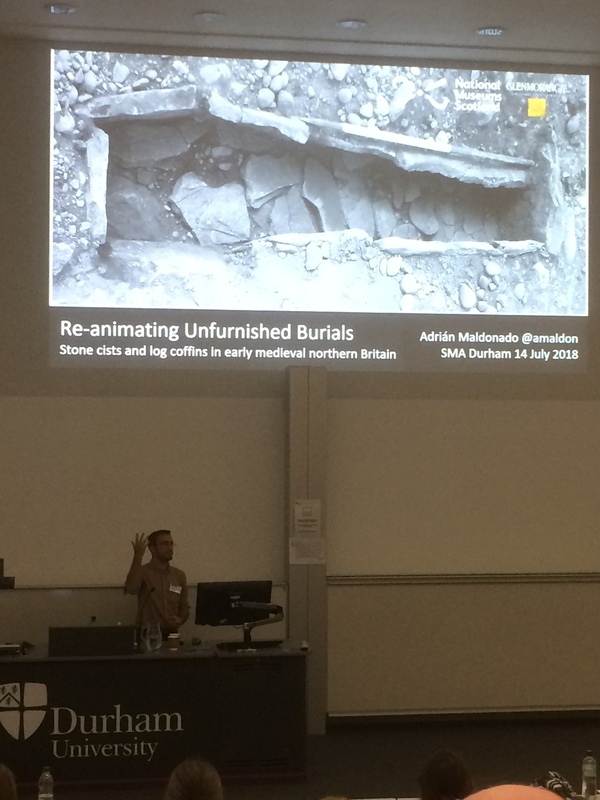 With 3 keynote lectures, 16 lectures and 18 posters, it was a well-organised, rich and varied showcase of the latest ideas and research on medieval funerary archaeology with a strong early medieval bias. My involvement was relatively limited. It was the first conference for ages where I deliberately decided not to present. Still, I had the honour of chairing the first session which included papers by two exceptionally talented and able archaeologists: Gareth Perry (University of Sheffield) and Femke Lippock (Leiden University). By not speaking I had an enhanced opportunity to focus on what others had to say. Still, I was flattered to see many of the speakers responding critically towards, and developing upon, my published works on early medieval mortuary practice and early medieval stone sculpture. Most welcome and least expected, my work on the public archaeology of death got a brief but prominent mention. Many of these papers dealt with mortuary spaces at multiple scales from individual graves, burial plots and intra-cemetery spatial patterns as well as mapping cemeteries to broader distributions in relation to other data. However, these presentations and posters weren’t primarily or exclusively about the interactions between mortuary practice and landscape in the Early Middle Ages: patterns or changes. Also, while these papers individually and collectively presenting new discoveries, methods and insights, I was struck by the relatively limited theoretical engagement and, in particular, the focus on two-dimensional Cartesian and mapped, rather than experienced and three-dimensional, space in relation to mortuary practices. Most papers and posters were seemingly stuck within very tightly confined pre-existing parameters. The key exceptions to this trend were notable: Maldonado, Gilchrist and to some extent Lippok and Sayer, who in different regards pushed us to think in new ways about burial data and burial space. While distributed through the conference, this second strand of papers collectively defined a more robust framework for approaching early medieval mortuary geographies. However, a collective criticism here was the lack of any explicit discussion of a coherent methodology for interrogating burial and monumental dimensions of the early medieval landscape and thus connecting quotidian and ceremonial dimensions. To conclude, I would note the near-absence of discussion of burial ethics and public engagement, which often takes place on a landscape scale. For example, I’ve discussed this in print regarding Sutton Hoo in the Introduction of my co-edited book: Archaeologists and the Dead. This was ironic given we were meeting in a city defined by the shrine of St Cuthbert and having visited the cathedral and the early medieval relics from his tomb. As a further example, the entire cityscape of Leicester has, since the ‘rediscovery’ of his grave, become a public mortuary landscape commemorating the life and death of Richard III…. In this sense, I want to highlight the importance of how the second keynote – by Professor Roberta Gilchrist – concluded. She addressed how present-day agendas affect how we conduct medieval burial archaeology. She flagged up our obsession with deviant burial and infant death: a point that has many ramifications for early medieval, as well as later medieval, archaeology and its spatial and landscape dimensions. A great conference that encourages to continue to research medieval mortuary practices in spatial terms: a credit to all involved. Thanks Howard! Great post-conference analysis! Yes I loved the programme and enjoyed all the papers and posters and especially the three standout keynotes! Given me much to think on in terms of early med, med and late-med burial. Great to have you with us for the event!